If Arthur Ashe were alive today, the fact that National Junior Tennis & Learning centers have spread across the country would give him hope, said USTA Eastern junior Brandon Torres. And it’s Torres’s thoughts about Ashe, and the way he expressed them, that made him one of 14 national winners of the 2012 NJTL Arthur Ashe Essay and Art Contest. Torres, who won in the Boys’ 10 and Under division, will receive President’s Box tickets to Arthur Ashe Kids’ Day presented by Hess on August 25 and attend an awards luncheon on August 26, hosted by former New York City Mayor and USTA Board Member David Dinkins. Download Brandon's essay. 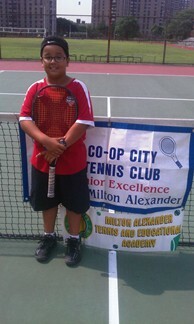 Torres attends Co-Op City Tennis Club in Bronx, NY and said he was honored to win the award. "I enjoy tennis very much and I enjoyed writing about a man who loved the sport as well," said Brandon. A USTA sub-committee selected the winning essays from over 1,100 submitted based on their knowledge of Arthur Ashe, message clarity, and writing style. The winning art pieces, which included over 700 submissions, were also selected based on their knowledge of Arthur Ashe and creativity. To enter the contest, children were asked to write an essay of 350 words or less, or create an art piece, responding to a specific question around Arthur Ashe and his great accomplishments. This year’s question – "If Arthur Ashe were alive today, what do you think would give him hope?" "We are truly proud to recognize this year’s Arthur Ashe Essay & Art Contest for their ability to define Ashe’s legacy and his passion for uplifting youth through tennis and education," said Karin Buchholz, Director for Community Outreach & Education, USTA. "As students of NJTL chapters from around the country, their work shows the lasting and positive impact that tennis and education has on their lives, which is what Ashe hoped for all along."